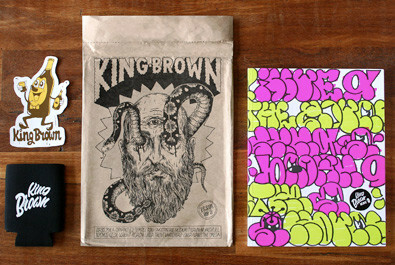 Includes a cool outdoor vinyl sticker by Dabs Myla plus a Kingbrown x Ironlak beer holder. Ed Templeton, Unga, Nychos, Huskmitnavn, Dabs Myla, Ghostpatrol, Vans the Omega, Numskull, Ozzie Wright, plus heaps more. 112 pages, printed full colour throughout. Cover printed with neon inks plus round sticker. Brown bag sewn closed for quality freshness. Finished size: 216 x 285mm. Perfect bound, made to last.